the jar with a spoon. Photo courtesy Jif. Do you have a great peanut butter recipe idea that you think is good enough to win a contest? You still have time to enter your original recipe in the Jif Holiday Spread Recipe Contest to win one of two $10,000 kitchen makeovers. 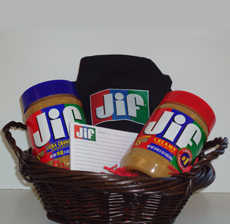 While your recipe just might be the winner, the odds of winning are much better in THE NIBBLE’s Gourmet Giveaway, which just happens to be a Jif Peanut Butter Gift Basket. Along with the gift basket, the winner will receive a Calphalon gourmet roaster to add to his/her kitchen cookware collection. HURRY! THE NIBBLE’s Gourmet Giveaway ends on January 10, and Jif’s contest ends on January 17. Retail Value Of Prize: Approximately $90.00. To learn more about Jif and the Holiday Spread Recipe Contest, visit Jif.com. To Enter This Gourmet Giveaway: Go to the box at the bottom of our Jams, Jellies, Preserves & Peanut Butter Page and click to enter your email address for the prize drawing. This contest closes on Monday, January 10th at noon, Eastern Time. Good luck!